Want to protect your iPhone but hate covering it up? Ecke ($22) is your dream case. Currently a Kickstarter project, the Ecke case is four small ‘knobs’ covering only the corners of your iPhone, protecting it from drops whilst displaying the already beautiful phone. The makers of Ecke were kind enough to send me a sample so I could try it out for myself; here’s my experience with the case. I want to disclose, first off, that I received a prototype model, which means the set you order is built with even better materials. I received four blueish purple plastic ‘knobs’, immediately ripped off my bulky case, and easily slid each piece of my new case on my iPhone. Ecke promises the case is easy to apply and remove, two statements I found to be absolutely true. It’s obvious which of the four corners is meant for the camera and the bottom two are outfitted for the speaker and audio jack. As advertised, there is no adhesive. Ecke also promotes a better grip. Compared to a regular case, my phone is still more slippery but not nearly as slippery as it would be without Ecke. I’m one of the those people who really enjoys how slim the new iPhone’s are; therefore, I really like the majority of its body exposed with only the corners covered for protection. Which brings me to the important part of the review: will it survive a fall? I stood next to my desk and began dropping my still-very-new iPhone on the ground to test Ecke. 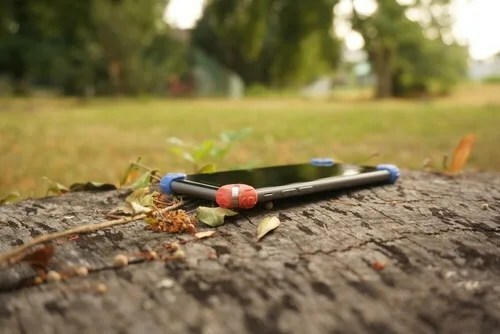 On Ecke’s Kickstarter page, the company shows the phone being dropped and landing on one of the protected corners, causing it to bounce and land safely. Naturally, I had to recreate the test; although, I used a thinly carpeted surface since my Ecke case is a prototype. To me, the practicality of this case is defined by whether or not the phone consistently lands on its corners, thus utilizing Ecke’s protection. Good news, it definitely does. This is the kind of case that isn’t for everyone. If you’re an outdoor enthusiast, of course you’re going to need a lot more coverage. However, for the typical iPhone user, Ecke is a great option. Ecke offers 20 different color choices, which means you can mix and match for the ultimate customization. With over 120 backers and a week left to fundraise, Ecke is accepting pre-orders via its Kickstarter page. Ecke expects to ship December 2015, in time for Christmas. I think the Ecke case is a brilliantly simple solution to miminalist iPhone protection. For those who love the elegance of an iPhone but want to keep it safe, give Ecke a try! Check out the Kickstarter video. This entry was posted in Apple news and tagged Ecke Case. Bookmark the permalink.